It is obvious that the gods are not pleased with me this year. Two of my most-looked-forward-to fragrance releases, by two of my favorite perfumers — the latest in the Jardin series from Hermès (which turned out to be Jardin après la Mousson) by Jean-Claude Ellena and the latest in the travel series from L'Artisan Parfumeur (which turns out to be Fleur de Liane) by Bertrand Duchaufour — are both melon-y aquatics. Despite a lingering nostalgic fondness for Aramis New West, the most melon-y aquatic of all melon-y aquatics, I just don't like the category. So if you're looking for an unbiased review (assuming such a thing exists), you'll have to look elsewhere. First, let me just say that I've been thrilled with everything from the L'Artisan travel series so far. Bois Farine, Timbuktu and Dzongkha are all in my collection. The new Fleur de Liane continues with the "voyage of the perfumer" theme; Bertrand Duchaufour reportedly found his inspiration for the fragrance on an island off the coast of Panama during the rainy season. Fleur de Liane is a green floral, and while the opening is markedly "fresh", admittedly it hasn't got quite the burst of marine that so makes me crazy in Après la Mousson. It starts out (and stays) very soft, and the blend resonates nicely with its rainy tropical forest inspirations: it's vegetal green and humid, and has a casual, relaxed feel in stark contrast to Mousson's fizzy spice-fest (the notes: ozone, marine and green notes, marigold, tuberose, magnolia, guaiac and cedar wood, vetiver, patchouli and mossy notes). The florals in the heart are likewise quiet, and laid over a (mostly-pale at first, deeper and darker as it dries down) woody earthy base that fans of Duchaufour's work will immediately recognize as bearing his signature. Much of the melon dissipates after an hour or so, but enough lingers to keep Liane dewy and wet straight through. Fleur de Liane is pleasant — it doesn't annoy me as much as Mousson simply because there's less cantaloupe. And it's arguably the most "accessible" of the travel series; certainly it's less overtly exotic than Timbuktu, but it doesn't strike me as veering off into bland, as did Duchaufour's last foray into fresh air and fresh water, Magnolia Romana by Eau d'Italie. But for all that, I can't love it. I know many of you haven't tried it yet, but if you try it later and you love it, do come back and comment. L'Artisan Fleur de Liane officially launches next month; for buying information, see the listing for L'Artisan under Perfume Houses. It can be found now, in 50 and 100 ml Eau de Toilette, at First in Fragrance in Germany. The green-vegetal-floral-fresh sounds good, especially with guaiac and cedar wood, vetiver, patchouli and moss. All are high on my wear well list. It's the melon that stops me, melon “blooms” on me. At least that was my experience with Un Jardin après la Mousson. I really don't think it is as overwhelming here. If you DID like melon, Mousson is arguably the more interesting scent — it has more presence than this one. Heh heh — a green floral with fresh aquatic melon — I want to try it just for the fear-factor aspect, although as you note, it can't be anywhere near as retch-inducing as Mousson. Maybe they'll have it in Chicago this weekend! Okay, I do have a small decant/large sample, and I like it, but that's about as far as it goes. It's lovely, but a bit too watery-melony for my taste, although the woody drydown is fresh and soothing. I prefer Bertrand's Timbuktu, and I can't wait to test his luckyscent fragrance which should be debuting later this Fall. Oh good, as soon as I read the description, it took me immediately (warp speed) back to my Mousson experience. I like melon in small bits and was surprised at the “in your face” note that developed. I do love Un Jardin Apres la Mousson – so I am hoping to like this one. Normally I like deeper, woodier scents but for the summer wearing a scent that's suppost to evoke rain and vegetal notes is a neat idea. I'll give this one a try for sure! If you think of it, do comment after you try it and tell me if I'm off-base, but don't think this one will strike you the same way. I'd think somebody in Chicago would have it, even if only behind the counter? And seriously, don't think even a melon-hater will find this one retch-inducing. Mousson is still a shock to me every time I spray it on. Soothing is a perfect description, R. I'll stick with Timbuktu as well, and yes, can't wait to try the Luckyscent! And it is very summery, at least to me — not an October scent (in the US, anyway) at all. I tried it at Barney's in San Francisco over Labor Day weekend. It was very fresh and green, didn't get a lot of melon, but I was not very excited by it. I also much prefer Timbuktu and Dzongkha. I am curious about the scent they are doing for Luckyscent, as the Barney's L'Artisan rep said it would be based on chapparal, and I have no idea what that smells like, but at least it will surely not be melon! From what the friends at luckyscent told me, Bertrand is aiming for a fragrance that highlights the smoke and fire of LA, the hot Santa Ana winds, and all that other craziness that happens when it gets hot and dry around here. Chaparral smells dry, for one thing — or at least, most of the time it does. So long as he isn't doing Southern California on a rainy day, you know? The Santa Ana winds — one of the few things I don't miss about Southern CA! So he's using that to evoke the dry desert of Southern California. If anything, it will be interesting and innovative. I know. So many crazy, weird things happen when those hot winds blow. It's interesting how both luckyscent's fragrance and LeLabo's LA fragrance will focus on all the bad things about LA, namely fire, dryness, smoke, and smog, lol! I'm not dying to try this as I was with Mousson (which I did like and am still hope to snag a 50ml bottle soon), though like you I love all the others in the travel series. I'm surprised that you describe the opening of Mousson as a “burst of marine,” which I don't quite perceive in the same way though it's of course fresh. As I mentioned to Kevin last week, I think I satisfied my “watery floral” craving by buying the Jo Malone Lotus Blossom & Water Lily in spring. Definitely don't need that many in the collection, and this definitely doesn't sound autumnal. Still curious to sniff it of course. Thx for reviewing. IrisNobile, I'm looking forward to trying this one, too. I'm grew up in Hawai'i, and one of my favorite smells is the muddy tropical forest. But my hopes are diminishing a bit, reading the reviews. Who knows, though — maybe you and I will love it! “I'm grew up in Hawai'i”?! Aren't typos embarrassing?! 'S ok, we haven't got good editing facilities, have we? And don't let your hopes drop just yet, I've seen some very favorable reviews at MakeupAlley. If you don't find melon in Mousson, you won't have to worry about finding it here — it's much lighter! But no, not autumnal at all. What, I thought the Le Labo was musk? Haven't been paying attention lately though, admittedly. Great – I'll head over there to read them and to bolster my flagging hope. Thanks! I think chaparral would be nice – my dogs used to come in after running around in the tall grasses and sage all day and smell wonderful. There are a lot of funky things about So Cal air, but I do enjoy the smell of sun-baked grasses. Thanks for reviewing this, I was hoping for no more melon. I am a staunch defender of Mousson, but something odd happened. When I added swimming to my daily routine, I suddenly couldn't wear Mousson anymore. I'm not sure if it's lingering chlorine (I do shower it off) or the sunscreen, or just my nose and the time of year, but the very perfume that I defended I now can't wear anymore. But of course, I'll try this one! Oh, I definitely get a blast of something melon-cucumbery in Mousson, but I don't mind it at all mixed with the spice sap. I just don't feel the need to further explore the watery theme… at least not right now. Funny how these waves/trends all arrive around the same time. Melon blooms on me as well, but luckily I am a melon fan. The cantaloupe in Mousson is a bit on the ripe side, but it creates a beautiful sensation IMO with the dry arid cumin. It definitely creates a nasal “environmental landscape” in my head. Smells better in the air than on skin. It can be frightening when you smell cumin on skin. Thanks so much for reviewing! I've been curious about this one, and now I feel safe in sampling it–I too was afraid of the melon. I noticed that when I saw to my horror that I had written “TOIO” instead of “TOO” recently on a thread somewhere. How did I manage to insert an “I” in there, but there was no remedy that I could see! As for Liane, LT is very down on this one in the latest updates, but as a Mousson and Acqua di Gio liker I am happy to give it a go. How rampantly melony can the thing be? : – ) It would be hard to beat my latest Artisan lemming scent of Jatamansi, though! Haha, Kohdo Day satisfies my “watery floral” craving too – actually, it doesn't quite satisfy it, as I am on quite a water lily kick just now – freesia and water lily, in fact. Maybe I am trying to make up for our rubbish British summer! Yes, me too. I really miss the smell of the air in northern San Diego where I used to live, although that's “sea smell” too. I was surprised that they adored Mousson & hated this one — seems to me you could accuse either of “another chance to experience [the melon-aquatic floral trend] in all its howling power” — in fact, would say it is Mousson that really harnesses that power. That said, don't feel like I can even say if they're “good” scents or not, I just have a visceral reaction to the category in general. I like Jatamansi too. Would love to have a 15 ml of it, don't like it enough to take on that giant bottle. It is very funny, and hope it isn't going to continue as a trend! That is very interesting. Wonder if it will appeal again come fall/winter? That is my least favorite part of living in SoCal as well… the scent does sound like it will be interesting though. I love smoky. Mousson is a canteloupe jolly rancher on me from start to finish, no fizz, no spice, no nothing. So the melon is putting me off from even wanting to try this one. But “green floral” is good, as long as it's more green than floral. Can you compare it to Jardin sur le Nil? Much softer (and flatter, though not in a bad way) than Jardin Sur Le Nil, none of that “rush of citrus” — it isn't quite THAT summery. Not so fruity. And I'm thinking the base is earthier & drier but haven't worn them together. What; are you punishing yourself – “every time I spray (Mousson) on”? LOL — maybe I am! Keep giving it “just one more shot”, I guess. I tried the scent over the weekend and surprisingly, the melon note was very brief, and actually… nice! I got more of the green & floral aspects. It got nicer as it developed, and was lovely, even 6 hours later…. It's not a 'buy' fragrance for me, I like darker fragrances but very well-done. For some reason the very melon that was barely there when I first tried it grew big and ripe and then over ripe and then brought all her over ripe melon friends with her. I'm not swimming anymore (too cold) and Apres Mousson still feels like someone smashed a cantaloupe over my head. This did not happen for the first two weeks I wore it. So now when I try Fleur de Liane, which is quite nice, I smell that melon and I'm afraid that, like Chuckie, it's baaaaack. So I'll try samples for a while first. It's an agreeable fragrance, but perhaps not full bottle worthy. At least not now. 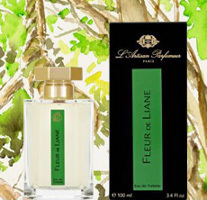 For me, Fleur d Liane is wearable to work as it doesnt have high notes like the citrus opening of Mousson. However, I would wear both, depending on the weather. I have worn Mousson but I like Fleur d Liane as well on days when I have to concentrate and I dont like perfume disturbing my concentration. Yes, I can see it working that way — not disturbing your concentration. But – I would not buy it?! The white floral notes are nice and calm and the scent is more subtle, the greens are very realistic, but there is not the same allusion to water, more to “wet” and also rotten melon. It is great somehow… it lasts good… hmm… I might ask Summer Santa for it at my birthday?! I just LOVE Fleur de Liane. I don`t care about aquatics and so on – i just love it! It`s light but stays the whole day and reminds me of my great holidays in Italy! I have tried Fleur de Liane, and it didn’t really work for me. The melon thing was just too much. It was ok for a little bit, but I got tired of it pretty quickly. I had hopes for this one when I read the base notes, but melon just isn’t for me.